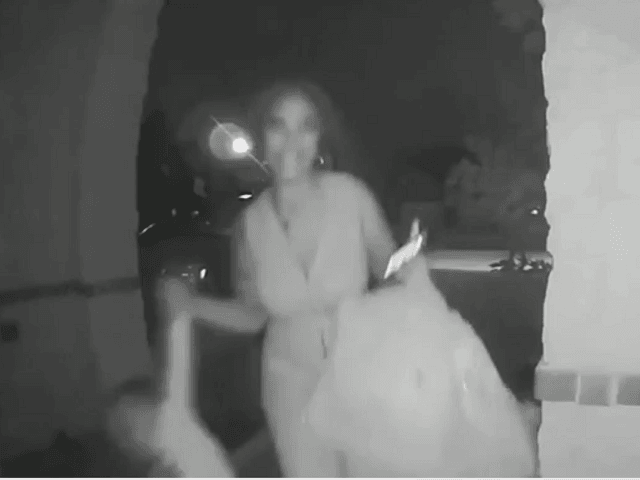 The Montgomery County Sheriff's Office in Texas posted video footage that appears to show a woman abandoning a 2-year-old child on a stranger's doorstep. He told detectives he was expecting his son to be dropped off by the mother in the afternoon, but when he wasn't, the father assumed plans had changed and left his home. Investigators could not immediately confirm these details. Afterwards, the boy was taken into protective custody but within several hours, tips from the public identified him. The mother said she was in the hospital on Wednesday and had a friend drop the boy off. She said by the time she reached her front door, the person was gone leaving the child behind. Spencer said deputies canvassed the neighborhood when the child was found Wednesday night, but no one answered the door at the father's house. Video embed code:The child's father, Willie Simmons, spoke to reporters on Thursday. However, the father of the boy said the woman was a friend who dropped off the child at the wrong house. A woman left a 2-year-old boy on a stranger's porch in Texas, in an incident that was captured on camera and covered widely by local media. Once the suspect arrived at the front door she rang the doorbell, knocked on the door, then fled back to her vehicle leaving the two-year-old child alone. The incident lasted 23 seconds, police said. Child Protective Services will ultimately decide who will have custody of the child. Authorities say it will be up to CPS on if the child will be returned to his parents. The video shows the unnamed friend rush up to the doorstep carrying the child by his arm. But on Thursday, the Montgomery County Sheriff's Office released more details about who the mystery woman and child were and the circumstances behind the disturbing scene.